In Wait Your Turn and The Stability of Large Systems, the first in a series of monster double features, award-winning novelist Peter Grandbois pulls back the curtain, revealing previously undiscovered behind the scenes footage of two of the most feared '50's movie icons: The Creature from the Black Lagoon and The Fly. Playful and painful, these novellas put the microscope to domestic life revealing the human in the monster and the monstrous in the human. 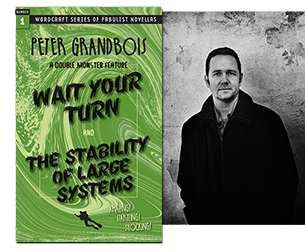 ​"Grandbois has a flair for telling stories in refreshingly unique ways...His writing is clear and concise with colorful phrasing and impeccable grammar. His dialogue flows naturally and never seems forced." "In this double feature, Grandbois peels back the scrim of the B-movie to reveal the wounded figures lurking behind, figures that cast shadows that seem from one angle monstrous but from another all too human. At once playful and painful--you'll never look at B horror in the same way again." ​PETER GRANDBOIS is the author of the novel, The Gravedigger, selected by Barnes and Noble for its "Discover Great New Writers" program, The Arsenic Lobster: A Hybrid Memoir, chosen as one of the top five memoirs of 2009 by the Sacramento News and Review, Nahoonkara, winner of the gold medal in literary fiction in ForeWord magazine's Book of the Year Awards for 2011, and a collection of surreal flash fictions, Domestic Distrubrances. His essays, plays, and short stories have appeared in numerous journals and been shortlisted for both the Pushcart Prize and Best American Essays. He is an associate editor at Boulevard magazine and teaches at Denison University in Ohio.